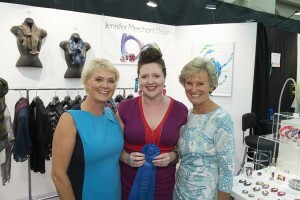 Jennifer Merchant is an artist who lives and works in Minneapolis. A graduate of the Savannah College of Art and Design, Jennifer is making a name for herself with her beautiful, one-of-a-kind pieces of layered acrylic jewelry that are crafted using a process she developed herself. She has earned numerous recognitions for her work, including ACE’s Best New Artist Award at last year’s expo as an Emerging Artist. I had the distinct pleasure of talking with her about her art, what has informed it and the things she loves most about The American Craft Exposition. Q: You started your journey as an artist working with metal. How did you come to work with alternative materials, namely magazines and acrylic? A: I started taking metalsmithing classes my senior year of high school. I loved it so much that I switched from wanting to go to college for a degree in fashion to metalsmithing and jewelry. I studied at the Savannah College of Art and Design where I learned a wide variety of techniques, I particularly loved the casting process and wax carving. At one point, one of my professors gave out some chunks of acrylic that she had acquired and did not need; I thought it was interesting and decided to try to carve it much like I had been carving waxes. I fell in love—carving acrylic was freeing to me. I could shape the piece, sand and polish it, and it was done. With wax carving you shape and sand it, then you have to go through a lengthy casting process, and then do any finishing techniques on the metal. I liked the immediacy of carving plastics. Once I knew I could work with acrylic, I experimented with layering it with imagery. It wasn’t until I graduated from SCAD and moved back to my hometown of Minneapolis that I made the full transition to alternative materials. I no longer had access to a fully equipped metals studio, I only had a few simple tools and found it difficult to continue to work with metal. I had a large magazine collection and some leftover plexiglass from a failed attempt at making display cases for my senior thesis show. I was pretty broke when I graduated, so I had to work with what I had, so I began experimenting more with bonding pages from the magazines between the plexiglass and then cutting and carving it. I called it layered acrylic, and I was thrilled with the effect the pieces had; bright and colorful from one angle of view, nearly transparent from another. Now I have moved away from magazines in favor of books, which have much better paper quality and fantastic imagery to draw from. 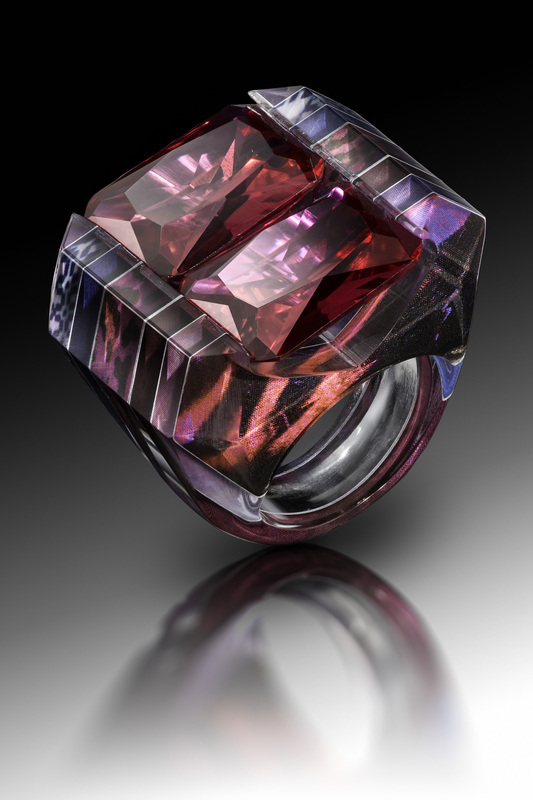 Q: The process of creating your one-of-a-kind pieces of jewelry is incredibly labor intensive. You have mentioned that the process has become as large a focus as your finished work. Why is that? What is it about the process that speaks to you? A: The process itself is something I had to create; I feel very close to it. At this point, it is mine and mine alone. That will not always be the case, but for now, in the early stages of my career, the process is as much a part of my art as the finished pieces. It is what I am known for. I am a visual person, I love art and bright colors. It is thrilling to take existing visual elements and sort of collage them together into my jewelry designs. The first step in the process of creating layered acrylic jewelry is selecting the imagery to showcase between the acrylic. Selecting the right images, and orienting them within a design are extremely important in creating a successful finished piece. This is one of my favorite parts of the process. I also love the sculptural element of the process, where I carve and shape the acrylic into the finished forms. It is a very intuitive step, I let the piece speak for itself as I carve. I have an idea in my head of how I want it to look, but I try to keep an open mind as I’m removing material so that I can make adjustments as I go to keep the forms balanced. I work best in three dimensions. My sketches can be quite rudimentary; I like to get the material in my hands and just go for it. Q: You mention pop art, geometric form and art deco design as core inspirations for your work. Those certainly seem apt when looking at your colorful, engaging designs. What has your relationship been with those various genres and how did they come to inform your art? A: Pop art is bold. I have always been attracted to pieces that make bold statements. My favorite artist, Roy Lichtenstein, was able to produce extremely bold works by simplifying the everyday and highlighting it in a stylized way. I love the idea of making something stand out by stripping it down to its essence and highlighting the part of it that speaks to you most. Roy’s signature style inspired me to want to create one of my own. My affinity for art deco design and geometric forms are closely tied together. Art deco’s use of geometric forms in repetitive motifs is of particular interest to me. I am drawn to sharp, angular geometric forms. Part of this comes from my love of faceted gemstones and natural crystalline structures. I have been fascinated by these since seeing giant crystal specimens at the Museum Company Store in the mall as a kid. Q: Wearable art is such an interesting genre. 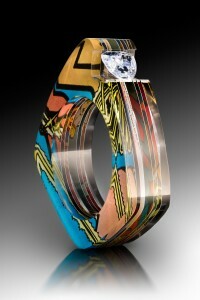 The fact that someone can wear the piece creates an intimate and unique relationship with the artwork. What it is about creating jewelry that appeals to you as an artist? Are there things that you most want readers to know about you or your art? A: I love jewelry, always have. When I was a kid you could not keep me out of my mother’s and grandmother’s jewelry boxes. I have vivid memories as a three year old piling on my plastic baubles. I would try to put every piece I had on at once, I could not get enough. It made me feel special and beautiful, like a movie star. I love glamour, and what is more glamorous than jewelry?! I also love to create, get my hands dirty, make things. I was the one in my grandfather’s woodshop trying to get him to let me use his tools and teach me to build things. I made friendship bracelets and created crazy outfits out of my mom’s clothes as a kid. Creating jewelry seemed to be a natural progression for me. I love not only creating, but making things that also have a function. I love visual art. I can draw pretty well, but I always felt more at home creating objects with a function rather than those that are purely decorative. I also have an affinity for objects that have multiple functions, which is why many of my pieces are reversible. Right now, I am working on some pieces that can convert and be worn in different ways. I also love pieces that have a secret. In many of my pieces I hide imagery within the designs that can only be viewed from angles when the piece is not on the body. I find it exciting to wear a piece that hides a little something that no one else knows about unless I share it with them. Q: What are you most looking forward to when you return as an exhibitor at ACE this year? A: I am really looking forward to seeing the beautiful new venue, I hear that the Chicago Botanic Gardens are absolutely breathtaking. The Chicago area has been very supportive of my work; I look forward to seeing returning clients and meeting new people. And as someone who spends a majority of my time working alone, it is fabulous to be in the company of the other artists! I have so much fun chatting with the other exhibitors, sharing stories and talking shop. Being at a show is as inspiring for the artists as it is for the patrons, if not more so. I can’t wait!